The land of black sand once expected a gold rush. Its residents were happy to help anyone willing to put in money required to dig up the precious metal from under their feet. Close to quarter of a century later, however, they are still waiting. The gold diggers did come. A first batch that arrived in April 1992 started setting up its base camp next to a craggy grey peak, the shape of a pyramid, rising humbly above the desert around it. The locals call it Koh-e-Daleel — the mountain of evidence. The terrain was inhospitable: no roads, no vegetation, no water, nowhere to stay. On a hot early summer day, they hammered steel pegs into the rocks and tied nylon ropes to them to build tents for themselves. They could not half finish their work when the wind arrived. No ordinary gust, it was as hot as a flame and sharp as an arrow; its local name is gorich but the locals also call it the wind from hell. It uprooted the pegs and snapped the ropes. Whatever tent structures had gone up, gorich brought them crashing down. The gold diggers, among them many foreigners, rushed to safety, rubbing and washing the sand from their eyes. Almost all of them immediately wanted to return to Quetta but that was not possible. They needed a place where they could spend the night before they could plan their next move. In 1993, Siah Rek and its nearby village Humai got another name: Reko Diq gold and copper mining project. A wise old man, Sakhi Jamal Deen Muhammadzai, lived in a hamlet, Siah Rek, named as a tribute to the charcoal-coloured sand surrounding it and situated not far from Koh-e-Daleel. He had, for decades, seen the prowess of gorich, as it blew from north to south, and knew well the havoc it could wreak. That afternoon, he knew something else: there were outsiders caught in the wind, a survey team working for BHP Minerals, an American firm. Muhammadzai immediately went to them. Finding them standing haplessly amid the tattered remains of their tents, he made them a voluntary offer they never expected. 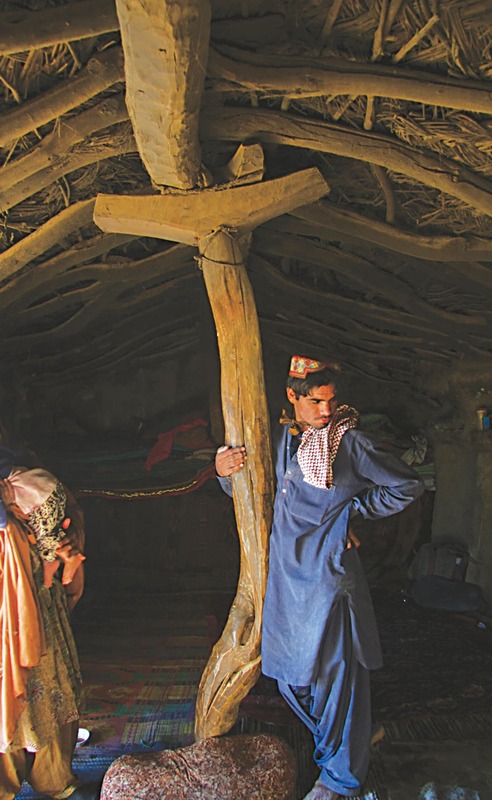 The outsiders could use houses in the village — not just for a night but for as long as they did not shift into their container houses expected from Quetta over the next few days. 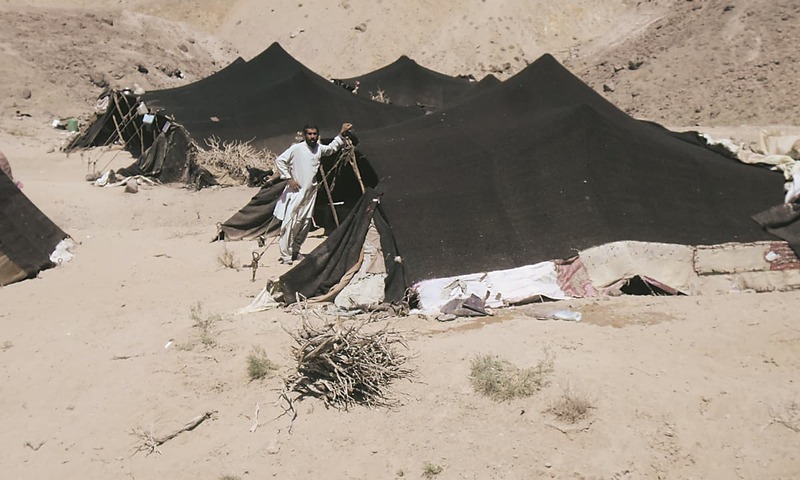 The villagers would shift to gidaans — Baloch tents made from goat and sheep skin, designed to ward off gorich. Stranded some 50 kilometres to the southwest of the nearest town – Nok Kundi – the BHP team had no option but to accept the offer. Marking distance and places in a desert is like drawing lines on sand. Maps, including the ones on Google, do not, for instance, show where the small village of Rutti is located within Chagai district: how far away from Quetta and in which direction? The dwellers of the desert recognise it through their tried and tested markers — water and vegetation. Rutti is a midpoint in the vast triangle that is Chagai district — wedged between Quetta to the northeast, Taftan (on the Pak-Iran border) to the southwest and Hamun-e-Mashkel lake to the southeast. To the east of the village is an area that has both water and vegetation and to its west is an immense nothingness: tiny hamlets separated by enormous stretches of desert — Siah Rek being one of them. In 1993, Siah Rek and its nearby village Humai got another name: the Reko Diq gold and copper mining project. 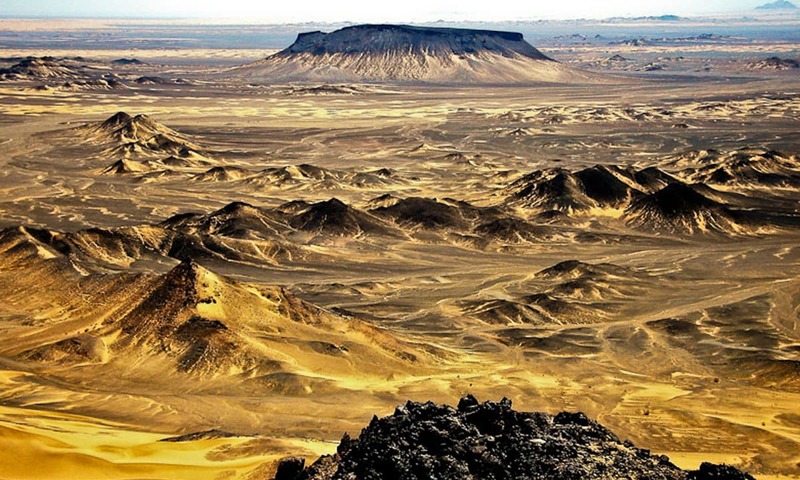 In the Balochi language, the name evokes infinite riches — sand (rek) and mounds (diq) of gold. On the evening of July 29 that year, the Governor House in Quetta was humming with an air of urgency, unusual for this stately mansion where nothing moves except at the speed of a snail masquerading as a bureaucrat. The signing of the Chagai Hills Exploration Joint Venture Agreement (Chejva) was just about to take place between the Balochistan Development Authority (BDA) and BHP Minerals, incorporated in Delaware, United States. The draft agreement stated that BHP and BDA would form a joint venture for prospecting and exploring gold and copper in Reko Diq. The joint venture was to “apply for up to ten” prospecting licences “covering an area of up to fifty square kilometres in the aggregate” with the provision that it could relinquish the whole or part of this area and apply for licences “over other areas”. In another major provision of the agreement, BHP and BDA were to make a respective contribution of 75 per cent and 25 per cent to the money required for the project; they would share the revenues also by the same proportion. Since the provincial government did not have any money available for investment, BHP agreed to lend it the funds it required on the condition that BHP will get the money back once the project starts producing mineral and metals — with a compound interest, charged at London Inter Bank Offered Rates (Libor) plus two per cent, added to the principal sum. On paper, the agreement did not look as bad as it later turned out to be, except that there was no provision in the provincial laws to create such a joint venture or for the grant of a prospecting licence to a foreign firm not registered in Pakistan. BDA also had no legal powers to enter into a joint venture as a party on its own. On July 13, 1993, Ata Muhammad Jafar, the BDA chairman at the time, arrived at the provincial secretariat in Quetta. He wanted the chief secretary to sign a file immediately. “Chairman BDA was hand-carrying the file...,” the then additional chief secretary Balochistan later recorded in an official letter. The file contained the draft agreement for the creation of the joint venture. The additional chief secretary did not let the file bypass official procedures and observed that the draft required, among other things, to be vetted by the provincial finance, law and planning departments. He also pointed out that the date already fixed for signing the agreement, July 29, did not in any case leave enough time to carry out the vetting before the two sides put their signatures to it. “Few people in the government really know what GOB [Government of Balochistan] is getting into in the agreement. Agreed that BHP is a good party, mineral exploration in the area is highly desirable but GOB has to be mindful of its interest specially the possible reaction of the people of the area to a large tract of land being reserved for BHP,” the additional chief secretary wrote. The two departments never had the chance to offer their input, let alone see the additions and alterations proposed by them in the agreement. How Jafar and BDA managed to change the “provisional nature” of the agreement remains anyone’s guess. Time seems to have been his best friend. Brigadier (retd) Abdul Rahim Durrani had assumed the post of acting governor of the province on July 19, 1993 – just 10 days before Chejva was signed – as had Mohammad Naseer Mengal, the acting chief minister. The provincial assembly did not exist at the time and a caretaker provincial cabinet had taken charge only days earlier. But someone, somewhere, knew the agreement suffered from multiple lacunae. Martin Harris, legal advisor to BHP, wrote a letter to Jafar on September 16, 1993, pointing out “we have discovered a number of oversights in the [agreement]”. He later suggested that the provincial government relax a number of provisions of the Balochistan Mineral Concession Rules, 1970 (BMR 1970). Subsequently, on January 20, 1994, ten days before the agreement became effective, the provincial government relaxed 13 provisions of the rules including those governing the extent of the area available for prospecting licences, exclusive rights over prospecting and exploration in the areas covered by the licences, the right to prospect and explore minerals other than those mentioned in the licences, the government’s right to acquire, merge and/or take over the project, and enforce royalty, penalties and compensation. These changes had multiple effects. The joint venture could apply for prospecting licences for an area spread over 50 square kilometres as opposed to just 10 kilometres as given in the original rules; within the area covered by the licences, the joint venture would have absolute monopoly and could prospect for and explore any minerals therein — not just gold and copper; the government lost many of its rights, as provided for in the original rules, to change the ownership of the joint venture and impose penalties and demand compensation in case official rules, regulations and terms and conditions of the agreement were violated. The company was indeed stretching the limits of its operations and the provincial government seemed to be readily obliging. Ahmer Bilal Soofi, representing the Balochistan government during the hearing of constitutional petitions challenging the agreement in the Supreme Court, revealed that the joint venture managed to get 10 prospecting licences on December 8, 1996 “covering an area of 1000 square kilometres”. Two years earlier, the provincial department of industries, commerce and mineral resources had provided the company a massive concession that it did not even ask for: a waiver from paying 3.347 million rupees as annual fee “for gold exploration in an area of 33,47,226 acres for a period of three years.” In a letter, dated August 11, 1994, BDA, the joint venture partner of BHP, had written to the department to give the company only an extension in deadline to deposit the fee. The new rules gave TCC unparalleled jurisdiction over the area it was prospecting and exploring. In 2000, under another caretaker administration, headed by Justice (retd) Amirul Mulk Mengal as the governor, BHP demanded more changes in the agreement — and got them. The objective of those changes was two-fold: to rectify some of the legal anomalies and inconsistencies that existed in Chejva in spite of relaxation in the application of BRM 1970 and opening the way for the company to eventually apply for and get a mining licence in the area where it was prospecting and exploring. The first change was affected through an addendum to the original agreement, authorised by Amirul Mulk Mengal in an undated letter. (“There are serious question marks on the manner in which the then Governor of Balochistan granted authorisation,” the Supreme Court would later point out.) The signatories were changed from BHP and BDA to BHP and Balochistan government (through its agent, BDA); and the company also obtained the right to enter into partnerships and alliances with other parties. The latter change set the ball rolling for BHP to involve Mincor Resources, an Australian mining firm, to create Tethyan Copper Company (TCC) in April 2000. In the meantime, Antofagasta, a Chile-based firm incorporated in England, and Barrick Gold of Canada formed a company, Atacama, owned equally by the two firms and registered in the United Kingdom. Atacama eventually bought 100 per cent shares of TCC in 2006 through the Australian stock exchange. TCC first started its operations in Pakistan as a foreign firm registered in Australia but running a local office here. In 2006, the government of Balochistan and BHP agreed to “novate CHEJVA so as to substitute TCC with BHP as a party” to that agreement. Subsequently, TCC registered its Pakistani subsidiary, Tethyan Copper Company Pakistan (TCCP), which practically took over all the prospecting and exploration activities and other work being done under the joint venture. By that time, the company – or the companies as the case may be – had sought and received multiple extensions in prospecting licences in violation of a Chejva provision which said that each licence would be valid for an initial period of two years and would be extended just once for another three years, provided that work on a feasibility study had started in the area covered by it. To overcome various legal hurdles created by changes in the name and ownership of foreign partner in Chejva, “TCC [soon after its inception] started lobbying for a new set of mining rules replacing BMR 1970,” says a retired official of the Balochistan law department, requesting anonymity. The Balochistan government wasted little time in coming up with Balochistan Mineral Concession Rules, 2000 (BMR 2000). The manner in which these laws were prepared was an extreme case of conflict of interest and a blatant instance of a government going out of its way to facilitate a private business. During the hearing of constitutional petitions at the Supreme Court regarding the Reko Diq project, senior lawyer Raza Kazim argued in January 2011 that the new rules were framed “under the influence” of BHP/TCC. Soofi, the counsel for the Balochistan government, revealed the new rules were prepared by the same law firm, RIAALAW, that had also represented BHP’s successor TCC at the Balochistan High Court during the hearing of a 2006 writ petition. When, under court orders, the law firm’s website was searched, TCC was found to be one of its clients. The website also showed that RIAALAW had provided assistance to the Balochistan government in the preparation of BMR 2000. This latter information was removed from the website in 2012. The new rules gave TCC unparalleled jurisdiction over the area it was prospecting and exploring. No other mineral company operating anywhere in Pakistan has ever enjoyed such perks and privileges. It had its exploration licences renewed till 2009, even when it had not submitted the mandatory reports for the feasibility of mining operations in the area; it also acquired a newly-introduced mineral deposit retention licence which entitled it to exercise exclusive rights over any mineral or group of minerals it discovered until the government made a final decision on accepting or rejecting its application for a mining licence; the company could amend, increase or decrease the area it had been allotted under its exploration licences; and, most importantly, it received the right to remove from the exploration area any mineral or group of minerals and sell or dispose off those minerals or any other materials excavated during exploration operations. After the new mining rules came into force in 2002 and TCC took over from BHP, it relinquished all its prospecting licences except one: EL-5, covering a huge area of 13,000 square kilometres, granted under a specially-devised BMR 2000 provision. Sources in Quetta say the company’s decision to drop the other licences was based on the information collected through the scanning of the area over a period of more than 14 years. The company knew exactly where the gold and copper deposits were and in what quantity, the sources add. Sometime in 2007, TCC prepared a draft agreement for starting mining operations in the Reko Diq area and started a vigorous lobbying campaign to have that agreement signed, said Ahmed Bukhsh Lehri, in a 2012 interview with the Herald. He was then working as chief secretary Balochistan. The draft agreement, a copy of which is in this magazine’s possession, offered only two per cent royalty to the provincial government (the internationally recognised ratio for royalty payment in mineral operations is six per cent) and it also provided that the company would set up none of the secondary and tertiary processing facilities it was required to under BMR 2000. Nawab Aslam Raisani, who became chief minister Balochistan in early 2008, was alarmed by TCC’s lobbying in favour of this flawed mining agreement soon after he came into government. He started holding meetings over the Reko Diq project and, after one such meeting on December 24, 2009, he unilaterally revoked Chejva. Tanjeel is a small mining reserve, and looks even smaller when compared to the huge area covered by the Reko Diq project. Only three kilometres away from where TCC proposed to dig its own mines, Tanjeel has an economic value of 10 billion US dollars and a mine life of 18-20 years. Going through a pre-feasibility study that TCC had prepared and submitted in July 2010 about mining operations over an area of six square kilometres – hidden within the thousands of square kilometres of land covered by EL-5 – the government of Balochistan found something helpful. Tanjeel was not mentioned in the pre-feasibility study in spite of the site’s proven gold and copper deposits. Also around the same time, Raisani turned down a TCC application for a mining licence. The provincial authorities, thus, decided to launch mining operations in Tanjeel under the supervision of nuclear scientist Dr Samar Mubarakmand with three main objectives: firstly, to prove to the international arbitration forums – where TCC filed a case in 2010 – that an early start of gold and copper mining was crucial to Pakistan’s economy (it could save at least 820 million US dollars every year for the country’s cash-strapped economy in substituting copper imports) and, therefore, the government could not wait for the outcome of what could be a lengthy legal battle between TCC and the Pakistani authorities; secondly, to test if the government could carry out mining and mineral purification operations on its own; and thirdly, to find a new venue for engaging the indigenous human resources trained and employed at soon-to-be-closed gold and copper mine at Saindak, also in Chagai. The Executive Committee of the National Economic Council (Ecnec) took up the project proposal for discussion in 2010 on the request of Balochistan government and approved it as a fast-track scheme. In that very year, the provincial administration allocated 8.8 billion rupees for starting the mining at Tanjeel; the project was to get 4.4 billion rupees every year until metal production at its mine started. Thus was born Balochistan Copper and Gold Project. Less than five years later, the provincial government decided to shut it down. A February 10, 2015 meeting of Balochistan cabinet concluded that continuing the project was not economically feasible since it was not making quick progress as was originally intended. Saeed Ahmed Jamali, secretary of mines and minerals department in Balochistan, says the project closure was long in the making. Nobody knew at the planning stage the volume of revenues and quantity of metals and minerals it was to yield, he claims. These things would become known only after drilling for mining operations had taken place — a stage for which the government could not invest money, he adds. An official of the Balochistan’s mines and mineral directorate argues that designers of the project also did not take into account the delays that official procurement procedures cause. They never realised how long it takes under official processes to procure equipment, he says. It was, therefore, an ill-conceived venture and the government’s time frame to start metal production from it was unrealistic, he remarks. Supporters of the project point out that money, not delays in machinery procurement, were to be blamed for Tanjeel’s slower than envisioned progress. Going by the original allocations, they say, the project should have so far received 26.4 billion rupees. In reality, it has spent much less — just a little above one billion rupees. Some of the big money was only allocated on paper. During the 2011-12 financial year, for instance, the provincial government released 55.34 million rupees but the project authorities could spend 47.81 million rupees — with the unspent money going back to the provincial exchequer. In the following year (2012-13), the allocation was as high as 1.465 billion rupees but the money actually spent was a miniscule 210 million rupees. 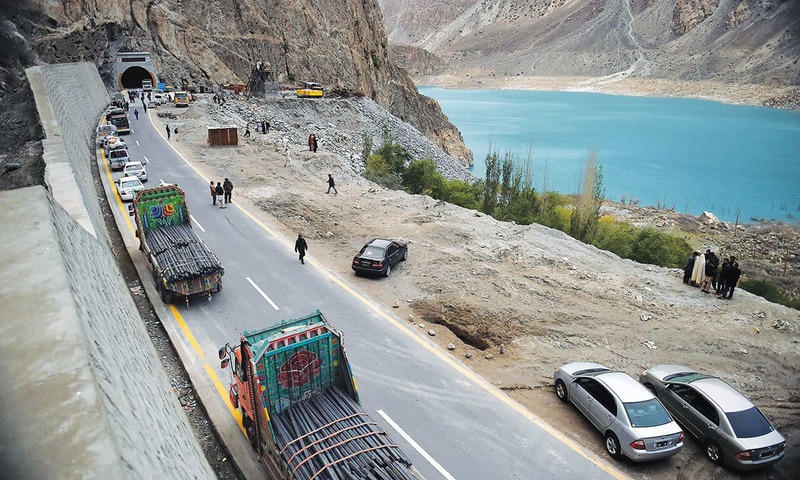 The penultimate year when the provincial government made financial allocations for the project – 2013-14 – it received 1.252 billion rupees; the money that could be spent was not even half of that: 571 million rupees. In the budget for the outgoing financial year (2014-15), mining at Tanjeel was allocated 90.4 million rupees but it is not yet known how much of it has finally come back unspent to the provincial government. Reko Diq contains one of the world’s largest copper-gold deposits, with estimated ‘mineral resources’ of at least 54 billion pounds of copper and 41 million ounces of gold. The proponents of the project also point to the progress that it has made in its four-year life: a number of administrative and residential facilities were completed at the project site; technical processes such as geological and partial structural mapping of the reserves were completed and contour mapping was done over 24 square kilometres of mining and processing area; three holes for metallurgical tests and geotechnical studies and 20 confirmatory holes were drilled; contract for the chemical analysis of 5000 ore samples was signed — analysis has already been done on two batches of 40 and 24 samples; bidding documents for the purchase of a Sulphuric Acid Plant were prepared and basic conceptual design and basic equipment design of Solvent Extraction and Electro-winning plants were completed; 11 pieces of equipments were purchased and received at project site. This is some progress, they say, especially when compared to what TTC – and its predecessor BHP – could achieve after having worked in Reko Diq for well over decade and a half. In any case, the project’s advocates argue, its continued operations would have helped Balochistan’s, and by extension Pakistan’s, stance at the international arbitration forums. This would have shown the international tribunals that a foreign company was creating unnecessary hurdles in the way of mining operations crucial to local development as well as the provincial and national economies. Sources in Quetta say both the civilian provincial administration and an army-affiliated entity, called Army’s Special Projects, are busy scrutinising Balochistan Copper and Gold Project for any misuse of funds and power in its execution. Indeed, during a conversation at an upscale restaurant in Quetta, a former employee of the now defunct project rushes to the provincial secretariat, leaving his lunch half-finished. Someone has informed him that the provincial government is planning to proceed under anti-corruption laws against the project officials who had done the process of reserving land for it. He was worried that his name could be in the list of those officials. Balochistan Chief Minister** Dr Abdul Malik Baloch decided to visit England this March, along with some members of his cabinet and a legal team representing his provincial government in international arbitration tribunals. One purpose of the visit was to hold talks with the representatives of TCC for an out-of-court settlement. Rumours were rife, at the time, that the Balochistan government was, in fact, interested in signing a new contract with TCC at terms and conditions different from those of Chejva. One of the main provisions in the new agreement would be to enhance the share of the Balochistan government in royalties and profits. But Malik surprised even the members of his own National Party (NP) when he refused to disclose the proposed contents of the negotiations with TCC. It was only after his return from England that the chief minister held a meeting with his cabinet – on May 4, 2015 – and told his ministers that, on the advice of his legal team, he has decided to hire foreign experts to invite fresh bids for auctioning blocks of copper and gold deposits at Reko Diq. One cabinet member later remarked, “The wheel is going to be reinvented after 25 years.” There were question marks over the timing of the decision, too. After all, both the International Chamber of Commerce (ICC) and the International Centre for Settlement of Investment Disputes (ICSID) had, in February 2013, rejected a TCC plea that the Balochistan government be stopped from carrying out any mining activities in Reko Diq area. Why, the critics ask, did it take the government more than two years to invite the new auction bids? Soofi, who is heading the legal team representing the Balochistan government at ICC and ICSID, says the decision took time because of the legal complications involved. He explains, in an interview at his Lahore office, that the first part of his team’s strategy involved getting rid of the embargo TCC was seeking from the international tribunals on any mineral operations in the Reko Diq project area, pending decisions on its applications for the resumption of Chejva and the payment of compensation. One of the main reasons why TCC could not get the ban it was seeking was the limited area of just six square kilometres that its feasibility study covered (the study was submitted to the government in 2011, years behind schedule). Soofi also narrates how, in an unprecedented development, he first briefed the Balochistan Assembly and then the Balochistan cabinet about the proceedings at the international tribunals, in early May this year. “It was very unusual. Never before has a lawyer gone to a provincial assembly and briefed it about a case.” His partners in London, however, saw it “as the most interesting development in terms of being transparent” to the people’s representatives who actually own the project. “I explained to them, I gave them estimates, I gave them a tentative assessment of the nature of awards that normally come about in international arbitration, the nature of expenses that we would incur and legal issues that we would face,” Soofi says, giving details of the briefing he provided to the provincial legislature. These explanations do not assuage the apprehensions of Raza Kazim, a Lahore-based lawyer. In April 2015, he filed a petition at the Supreme Court seeking to restrain the federal and Balochistan governments from pursuing an out-of-court settlement with TCC. He insists the government is not revealing a number of important facts and is not sharing relevant papers and records with the public. Any out-of-court settlement arrived at without the public knowledge of those facts and documents will be anathema to public interest, he argues. Some petitioners approached the court with petitions for the termination of the agreement, deeming it against the interests of the Pakistani state and people. His application, indeed, brings to light some little known, but extremely important, facts about the Reko Diq project. Quoting from TCC’s application at ICSID, Kazim states that the mineral deposits in the area are much bigger than is already known and they are not difficult to explore given their physical and geological conditions. “In the last 20 years, only one other viable world-class Greenfield copper deposit has been found – the Hugh Dummett deposit at Oyu Tolgoi in Mongolia, in 2001. Since then, despite billions of dollars spent on exploration, the world’s mining companies have found no copper deposits greater than or even equal to Reko Diq,” he cites from TCC’s claim to substantiate his argument about the size of the deposits. “Reko Diq contains one of the world’s largest copper-gold deposits, with estimated ‘mineral resources’ of at least 54 billion pounds of copper and 41 million ounces of gold … In fact, Reko Diq is one of the only three known pre-production deposits in the world with more than 44 billion pounds of copper and more than 40 million ounces of gold,” the TCC claim further reads. “Reko Diq’s [rock formations] are largely exposed but not deeply eroded. As a result, the mineral deposits at the site have not been worn away over time, yet are close enough to the surface that the costs of extracting the ore will be significantly lower than in comparable projects,” Kazim cites. “… [T]he enormous size and favourable geological characteristics of its copper and gold deposits … the relatively low technical risk of the anticipated mining project when compared to the challenges faced at other large deposits; and … its high commercial value, in the fact of very low likelihood of a comparable deposit being discovered or becoming available for purchase,” reveals the claim further, leading Kazim to demand the court that it make the government award the contract for the project only after it complies with Extractive Industry Transparency Initiative (EITI). This initiative is a coalition of national governments, companies, civil society groups, investors and international organisations committed to promoting transparency for responsible management of natural resources and for realising the potential for growth and economic development that those resources can provide. The Supreme Court has not yet fixed a date for taking up Kazim’s petition. Litigation over Reko Diq started in 2006. In a constitution petition filed that year, Maulana Abdul Haq Baloch and others approached the Balochistan High Court, praying for a termination of Chejva. The high court dismissed the plea on June 26, 2007. The petitioners then challenged the verdict at the Supreme Court. In 2009 and 2011, some other petitioners approached the same court with similar petitions for the termination of the agreement, deeming it against the interests of the state and people. The proceedings in the case continued throughout 2011 and 2012. 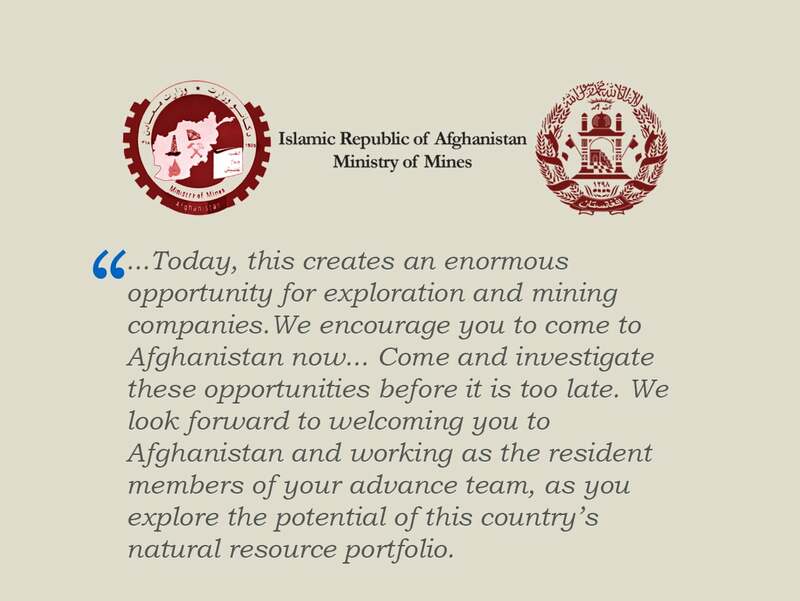 At one stage during the hearings, Kazim presented before the court a draft of the Qara Zaghan Gold Project (QZGP) to be signed between a private company, Afghan Krystal Natural Resources Company, and the government of Afghanistan. His objective was to show how Chejva, in comparison with the proposed agreement in Afghanistan, was a flawed document that heavily favoured BHP/TCC without safeguarding the interests of the people of Balochistan. 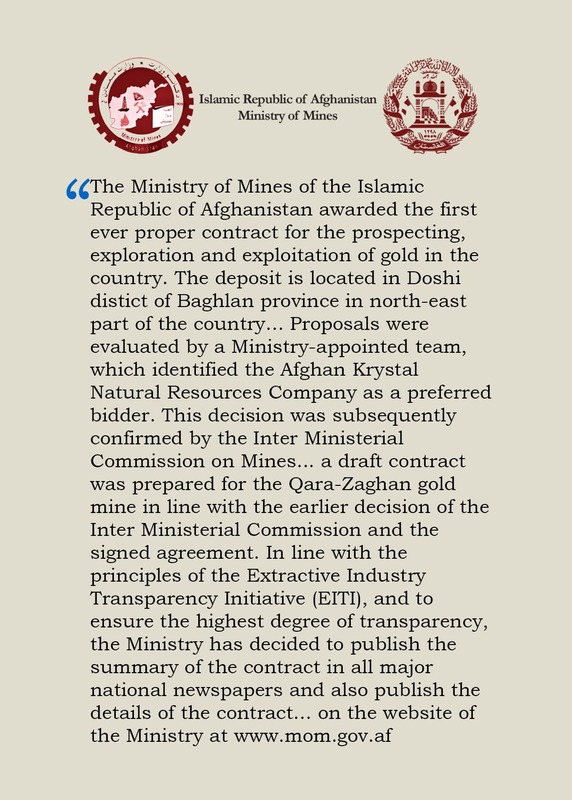 The official summary of the draft of the Afghan agreement, eventually signed on January 10, 2011, states that the process for awarding the contract started in the middle of 2008 and, by early 2010, the government selected Afghan Krystal Natural Resources Company for signing the agreement from among the three companies that had submitted bids for the project. The selection criteria was simple: The selected company offered to invest the highest amount of money in the project (50 million US dollars), promised the highest annual production (1.628 tons) and committed to paying the highest royalty to the government (26 per cent). 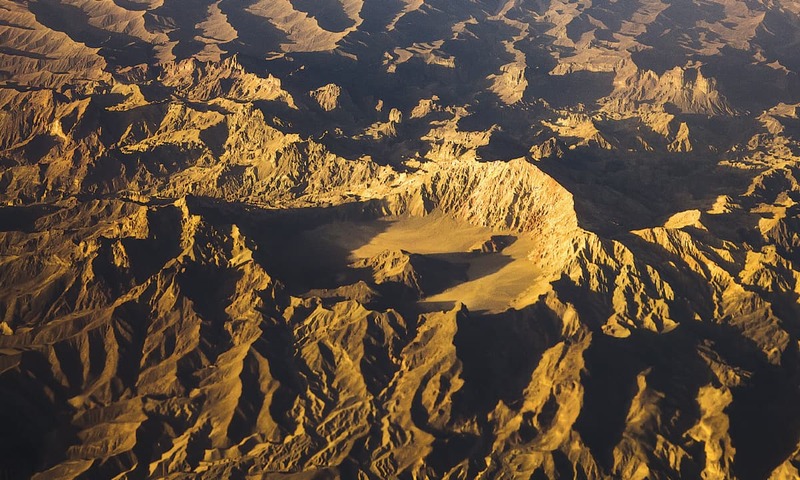 A successful bid for involvement in the Reko Diq project – either for a part or the whole of it – may help MCC get out of a mining project in Afghanistan where it no longer seems interested in operating. The draft agreement provided that all “equipment and machinery required [for the project] will be provided by Afghan Krystal Natural Resources Company… [and the company] will strictly comply with all the environmental safeguards in line with the laws of the country.” The other provisions required the company to create “280 job opportunities” and offer “social services to the people of the region such as building schools and clinics”. Most importantly, an official Afghan document notes: In line with the principles of EITI, the government “has decided to publish the summary of the contract in all national newspapers and also publish the details of the contract on the website” of the government. Referring to Kazim’s presentation, the Supreme Court compared the two agreements – the one for QZGP and the other for Reko Diq – and concluded that the latter was “entered into for an inadequate consideration as regards the percentage interests” of the provincial government and that many of the developments therein, such as the authorisation for the inclusion of an addendum in 2010, were of suspect nature. The court also conducted detailed hearings on a number of other questions raised about Reko Diq, including the ones about the legality of changes made in the agreement itself – through the addendum as well as with the novation agreement – and those brought about through mining rules and regulations, first by relaxing BMR 1970 and later by promulgating BMR 2000. 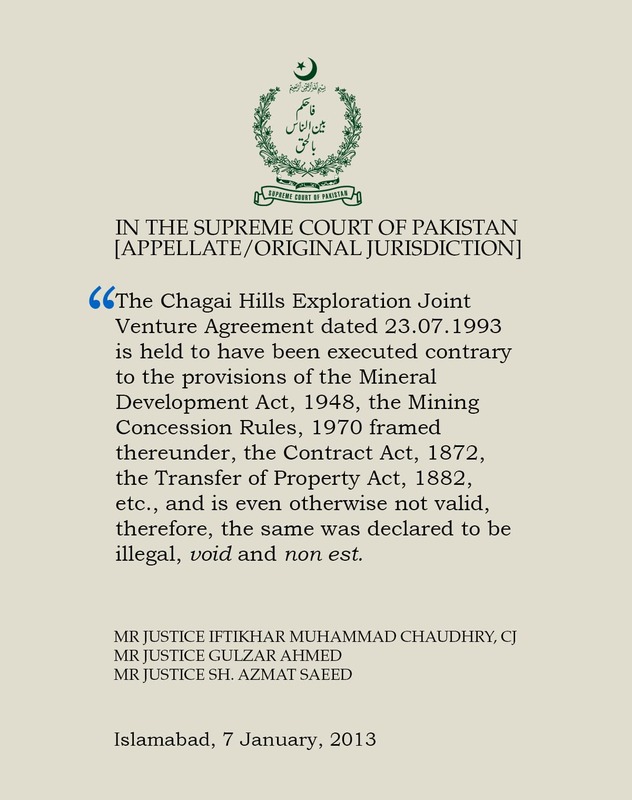 On January 7, 2013, a three member bench of the apex court headed by the then Chief Justice Iftikhar Muhammad Chaudhry, declared Chejva “illegal, void” and non-binding because it violated the Mineral Development Act (1948), the Mining Concession Rules (1970) and the Contract Act (1872), among other laws. In its detailed 150-page verdict, the court declared that changes in the parties to the agreement – from BDA to the Balochistan government and from BHP to TCC – were also held to be illegal and void. A dirt track, moving south-west and covering some 50-kilometre stretch of Dasht-e-Goran, or the Goran Desert, links Reko Diq project area with another copper and gold mining project in Saindak. Another 40-kilometre-long road, with metalled top, connects Saindak with Taftan, located on the thin end of a triangular territorial wedge that district Chagai is. In 1995, the government launched a gold and copper mining project at Saindak but closed it down after a trial run of a few months, due to a lack of funds and falling prices of copper, gold and silver in the international market. The project was restarted in 2001, after the federal government awarded a mining contract to a state-owned Chinese firm, Metallurgical Corporation of China (MCC). The contract was initially valid for 10 years but later it was extended for another five years. It gives Balochistan only two per cent royalty; the federal government owns 48 per cent stake in it, while MCC has 50 per cent share in its ownership and profits. 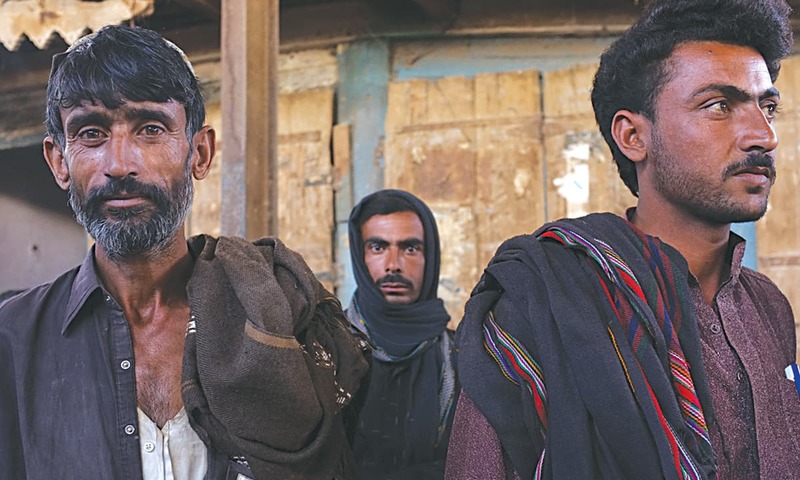 Set to end next year, the mining contract “has not brought any change in the lives of the people of Pakistan’s largest and one of the most impoverished districts”, says Noor Ali Sanjarani, general secretary of a network of non-government organisations in Chagai. Yet, there are reports that the same company that runs Saindak may soon bid for, and receive, official approval for carrying out mining operations in Reko Diq. The Chinese company, in fact, has been interested in Reko Diq since the 1990s. Even when TCC was conducting its prospecting and exploration work there, MCC approached the provincial and federal governments with a proposal to develop the Reko Diq project. In January 2009, MCC, along with TCC, was invited to a meeting of the joint steering committee of the federal and provincial governments which oversees the project. The two companies presented their respective financial and technical proposals even though TCC protested that MCC had no legal right to offer proposals for a project in which TCC had already invested more than 200 million US dollars. On January 23, 2009, the steering committee rejected MCC’s proposal. Speculation about a possible role for the Chinese firm in the future development of the Reko Diq project did not end, though. Timothy Livesey, chief executive officer of TCC, deposed at ICSID in November 2012 that a local employee of his company had seen a convoy of vehicles travelling to the Reko Diq site, led by an employee of Balochistan Copper and Gold Project. Some of the vehicles in the convoy and their drivers had been supplied by the nearby mining project (Saindak) operated by MCC, he said. 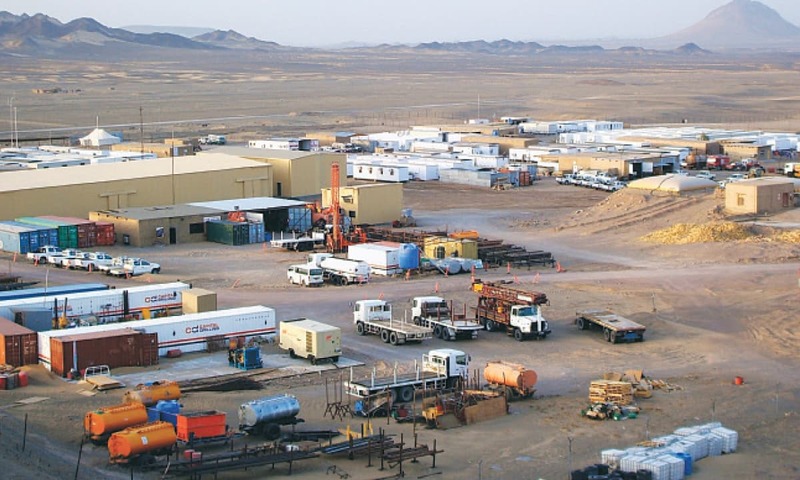 A successful bid for involvement in the Reko Diq project – either for a part or the whole of it – may help MCC get out of a mining project in Afghanistan where it no longer seems interested in operating. 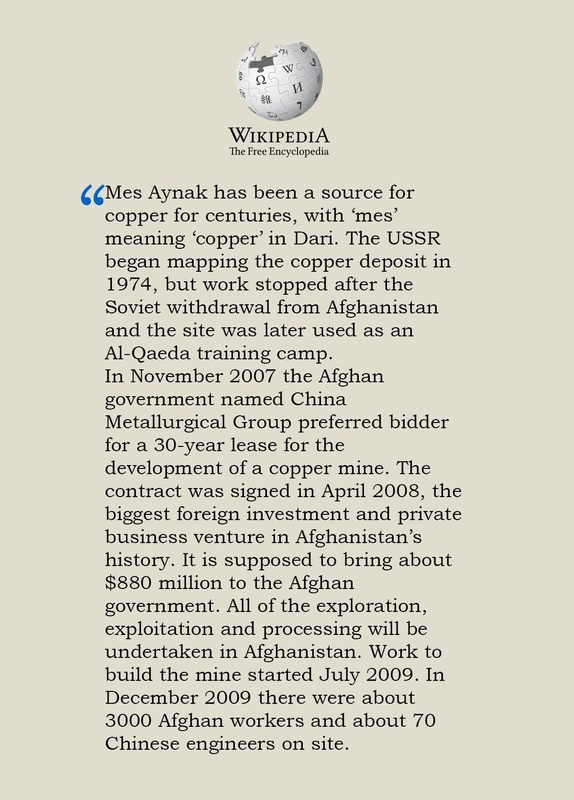 In early 2013, news reports appeared about a conflict between the Afghan government and MCC over Mes Aynak copper mining project in Logar province, southeast of Kabul. These reports suggested that MCC no longer wanted to abide by the terms and conditions of the three-billion US dollar contract it had signed in 2007 for mining at Mes Aynak. The company wants to renege on its commitment to build a railway line, power plant and processing factory, as provided for in the contract, newspapers quoted business sources as saying. TCC’s Pakistani employees had informed intelligence agencies that the company was hiding crucial information about the discovery of some strategic mineral resources, in an area falling under one of its ten exploration licences. 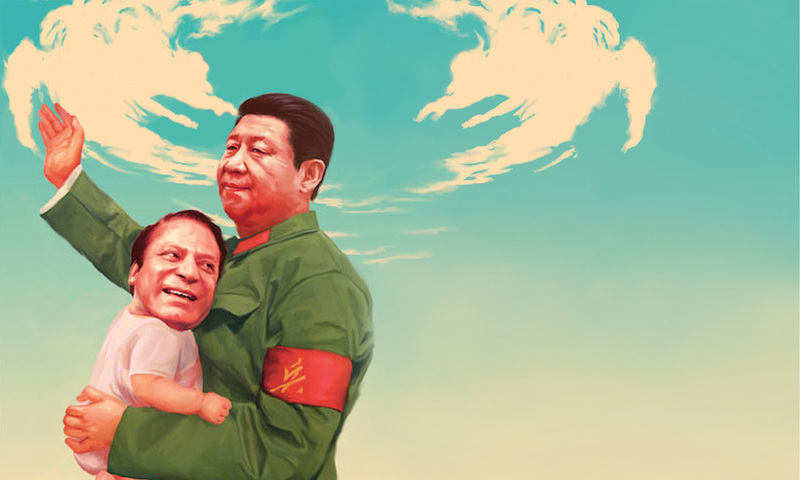 The Chinese firm expects to get a better deal in Pakistan. Many in Balochistan, citing security reasons, see an official tilt in favour of MCC owned by a friendly and ever-cooperative neighbour which is investing heavily in various parts of the country, including Balochistan. Roshan Baloch’s voice sometimes drowns in the noise of an electricity generator he is using to light his house in Dalbandin town. He has worked with TCC for three years and is the district president of Chagai for the NP that leads a coalition government in Balochistan. He does not believe in any of the reasons cited by the provincial government for not awarding the Reko Diq project to TCC. A security official in Quetta lends credence to Roshan’s analysis. He claims that federal security agencies working in the province are convinced that Baloch separatist groups have the financial backing of “some foreign mining firms operating in the province”. Then there is the element of real or perceived deception. In December 2009, when the Raisani government terminated Chejva, there were rumours that one of TCC’s Pakistani employees had informed intelligence agencies that the company was hiding crucial information about the discovery of some strategic mineral resources, in an area falling under one of its ten exploration licences. Chagai, spread over 44,748 square kilometres of sand dunes, is Pakistan’s largest district, area-wise. Besides being the site of the country’s 1998 nuclear tests, it is known for its massive mineral resources – geologists, so far, have identified the presence of 23 minerals here. 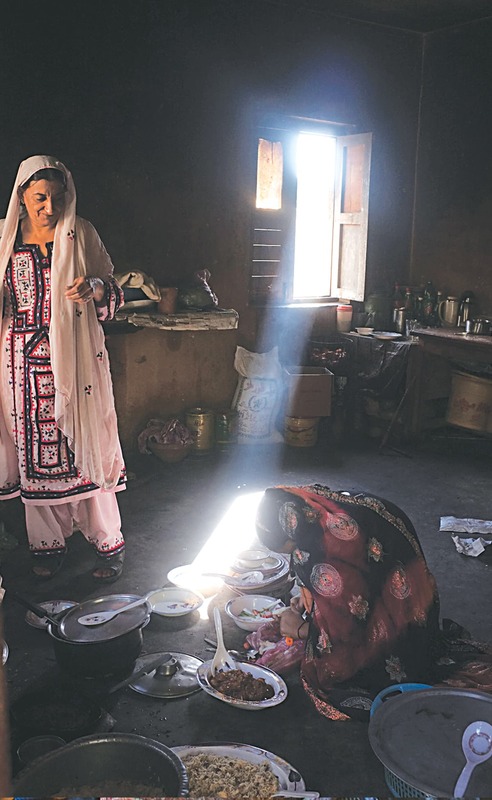 Variously called by opinion writers as a local El Dorado and key to the country’s economic future, it is mostly a Pakistani version of the Australian outback — arid, sparsely populated, impoverished and underdeveloped. Roads are difficult to find here, as anyone travelling from Nok Kundi to Reko Diq will find. After the first 25 kilometres, even the dirt track disappears under boulders flowing through multiple small streams (called rud by the locals). Malik Ahmed Muhammadzai is hunched in the backseat of a car, near the Pakistan-Iran border-crossing in Taftan. Worries line his forehead. The eldest son of Sakhi Jamal Deen Muhammadzai, he remembers the day when his father offered their house to a team of gold diggers for shelter from heat and sand-strewn gorich. “When my father offered to help BHP, he only hoped that the company would bring employment and some basic amenities for his people,” he says. Those hopes have not materialised and the putative owners of what is known to be one of the world’s largest deposits of gold and copper remain as resource-poor as they always have been. “Rearing goats and sheep was, and still is, the sole source of income here,” he says. 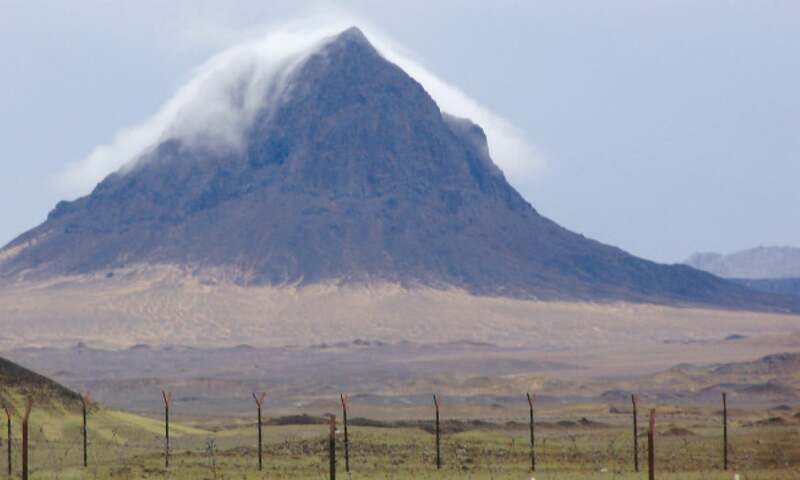 Koh-e-Daleel, the mountain of evidence, stands as a silent witness to their plight — starkly visible with no vegetation, no cloud cover to hide it. Additional reporting was done by Sher Ali Khan in Lahore and Syed Ali Shah in Quetta. This was originally published in Herald's July 2015 issue. To read more, subscribe to Herald in print. Afghanistan is the mineral capital of the world from ancient days. Amazing coverage. Takes guts, insight and a whole lot of hard work. Good work Herald/Dawn. What ever the out come of project, these local people deserve a better life, best wishes for them! A very detailed article and an excellent read. BHP is an Australian company, not American. Interesting read...though it lacks some essential information that readers like me would love to glean such as the royalty agreement between BHP/TCC and the Balochistan Government, outcomes of EIA done on the project etc. BHP incidentally is an Australian mining house....not American as indicated in your story. I also wonder if recent visit by Australian Julie Bishop had anything to do with negotiations with Federal or Provincial governments and the Australian giant BHP?? Australians are notorious for towing the line of Australian multinationals working abroad. 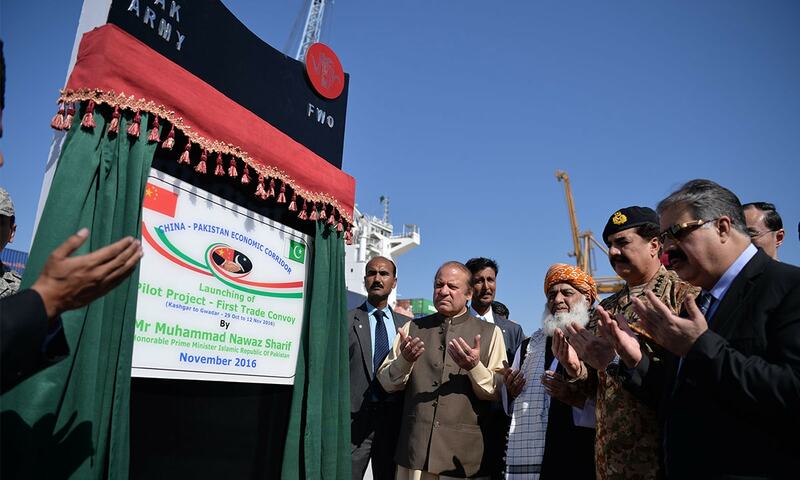 Pakistan's future lies in Balochistan: Gwadar, CPEC, natural rescources, the sea and so on. Islamabad and Quetta must make it a priority to bring the small population to economic hights. This can be done with such small populations of "only" 15-17 millions compared to other states. Great and insightful article. It really illustrate how dysfunctional the state has become due to corruption, sub-optimal governance and overlapping decision making structure. A tribal Baloch leader in the area would have struck a better deal than the one which is now the talk of cities in the world. It is unfortunate that mineral resources worth trillion of rupees are lying untapped and unexploited while the population in the area is one of the poorest in the world. It is politics stupid that has thrown us all to the quagmire of poverty. 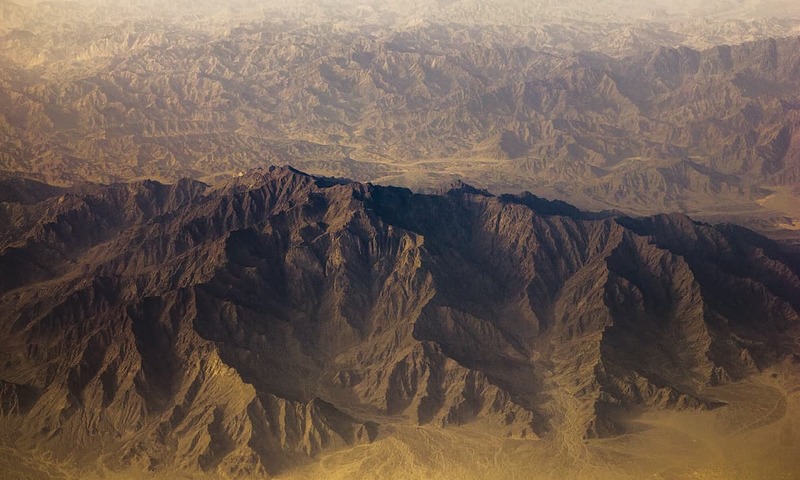 The article is less about the magic mountain and more about the history of navigation through legal terrains to acquire mining rights in Balochistan. Boring! Anyone in modern day mining will tell you that thanks to satellite imaging an other technologies discovering minerals has become a lot easier. However, taking those out remains a costly proposition and only makes viable sense if reserves are not too deep in the earth's crust. Also if the technology is tried and tested which is efficient and minimizes losses. This is why only true alternative is to work with handful of top mining companies in the world who know how to do it. Also, since they are profit companies they will take profits from those operations while delivering profits to the region. It saddens me to see amateurs like Samar Mubarakmand wreak havoc by getting involved in projects like Reko diq and Thar coal causing billions of dollars of losses to the national reserves. He has now done it multiple times claiming that he has a cheaper method to mine while failing miserably and lining his own pockets. Result is that Requ Diq remains un-developed. Let us be realistic and talk only what we know for sure. Not many people would know that, much before discovery of Sui gas fields, there was a news about discovery of large oil deposits in Mekran. The American company that discovered wanted huge concessions but, Pakistan Government wanted the "controlling share" of 51%. The matter continued dragging but the firm stand of the Government in the interest of the nation was not compromised. When they did not get their say, they gave the whole thing up saying there was some mistake made in explorations and in fact, there was no oil in that area. The company just packed up and left. We must understand that, they only come to such places when they are absolutely sure of what they want. Nobody would do our dirty work for us in any love for us. We shall to develop and rely upon our own expertise and resources. Pakistan has to develop its own capacity to process these minerals. It is not rocket science. The foreign companies will always follow "Luto and phuto". Balochistan can only developed its own capacity if the sons of Baloch Sardars study Geology, Chemical Engineering, Metallurgy and Business Administrations. Otherwise it will stay as such, as has been the case. These were the worst blunders in the history of Pakistan, they never provided the feasibility report and have done mining over a vast area. Apart from this they only offered the BDA 25% of the profits, provided that BDA also invests in the project equally. Knowing the fact the BDA never invested any such amount in all of Balochistan, this enabled them to get 100%. They never provided reported what they extracted. No development has taken place in the area. Apart from this they spread insecurity and lawlessness amongst the local population. A conspiracy theory moved around TCC that for the survey purposes they used HARRP technology as a weapon in Chagghi area to develop an Earthquake of 8.00 magnitude. If you check the archives the earthquake surprisingly had only 10 km depth with such a huge power. Apart from this they also provided details of information to foreign agencies about the structure of nuclear lab through the scanning they did. Now we can see they got the license of few kilometres but scanning was done for thousands of kilometres. The same reason they were also funding the non state actors in the area so their activities go unnoticed. Such is the bad luck for our people that none of the government has ever been serious about changing the lives of common people. Every one has made the life of the common man worse. The only leader who worked for Pakistan was M A Jinnah. Ch Rehmat Ali also died in a miserable condition in the Meo Hospital Lahore. Fatima Jinnah died under mysterious circumstances. Liaquat Ali was also attacked. Mr Bhutto was hanged by our own Generals. They did not allow any serious leader to work for the people. Contrary to that only those have ruled here whose parents also served in the British Raj. A wonderful read! Great job, Herald! Hope this raises awareness about how firms and corrupt governments cooperate and puts pressure on both to shoulder their responsibilities. Just do it yourself and where needed get one or two outside experts. Don't let others exploit pakistans wealth for themselves. @M.Saeed it is a revelation..but why did the government and other companies in the world show interest in the project after that? Great article, kudos to the author. I wonder if the author is aware of the gold/copper deposits of Koh-i-Sultan, also near Nokkundi. They are also a bit of a mystery with regards to their paperwork, first belonging to Lake Resources which was associated with Reko Diq in the very early stages and now with Colt Resources which merged with Lake and is based in Dubai. Seems that some of their map filings have significant overlaps with that of TCC and they follow a similar model with a local JV. Very dubious. Greed and corruption will never allow Balochistan to be prosperous. The fate of the area is held by mafia/politicians and war lords. Good luck to BHP or anyone else. Very good job for covering this. This is perhaps the most well researched piece on Reko Diq Project on Pakistani media. Good going Dawn! @Afghan Malhan, mineral capital excellent coinage indeed. Many many thanks. BHP Minerals is an Australian company.